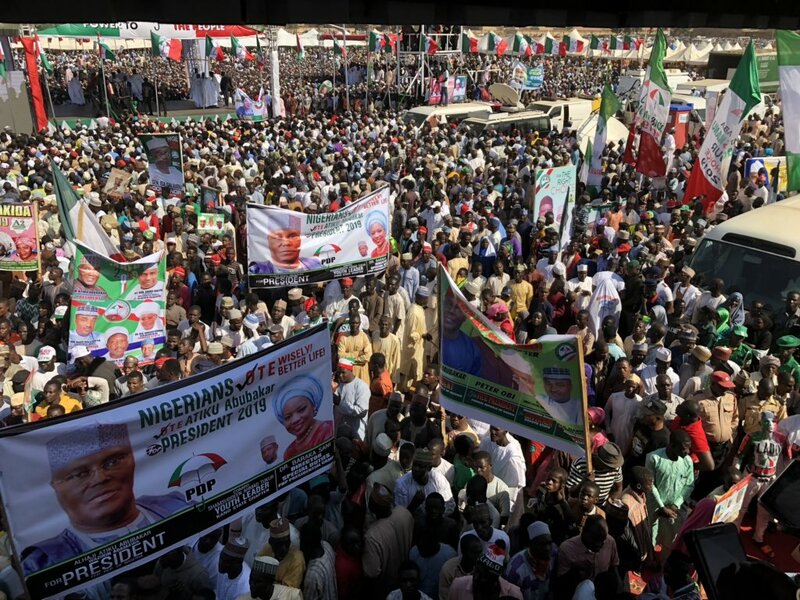 Atiku Abubakar, the Presidential candidate of Nigeria’s main opposition People’s Democratic Party (PDP) on Monday kicked off his campaign in Sokoto, Northwestern Nigeria. From the mammoth crowd that came out to welcome Mr Abubakar and his PDP campaign team, it is obvious that the support base of incumbent President, Muhammadu Buhari is fast dwindling as Nigerians consider other options for leadership of what was once Africa’s largest economy. Buhari who came into office in 2015 on promises of fighting corruption, putting an end to Boko Haram insurgency in parts of Northern Nigeria and creating jobs and opportunities for Nigerians has become bogged with accusations by Nigerians and members of the opposition that he has failed to deliver on his promises. The Brookings Institute, in a recent report, stated that based on its projections, Nigeria had overtaken India as the country with the largest number of extreme poor in early 2018 with about 87 million people in extreme poverty surviving on less than $2 a day. Apart from this, despite being a former army general, Buhari’s record in the fight against insecurity and insurgency has been less than stellar as the spate of kidnappings, herdsmen-pastoralist conflicts and terrorist attacks have not abated but have taken newer dimensions that are putting the lives of Nigerian citizens and its armed forces at greater risk. In late November, Reuters reported that an attack by Boko Haram Splinter group ISWAP on a military base in Maiduguri had left 100 soldiers dead; another in a series of brazen attacks by insurgents in parts of Nigeria’s North. Buhari’s main opponent in the February 2019 general elections, Atiku Abubakar released his policy document recently to much acclaim and stated that for him, national security is multi-dimensional and has gone beyond armed defence to include protection of democratic and constitutional values like food security, peace, human, political and economic security. His plan includes resolving the unfair access to democratic dividends to reduce internal armed conflicts, insurgencies, crimes and militancy and a plan to diversify Nigeria’s struggling economy, restructuring the polity to bring better governance to Nigerians and create opportunities and wealth. Many Nigerians, especially in Northern Nigeria, consider the former Vice-President’s solutions to insecurity, unemployment and poverty practicable and Atiku’s support base in the region which happens to be Buhari’s stronghold has continued to grow. On Monday, thousands lined the streets to welcome Abubakar to Sokoto, the seat of the Sokoto Caliphate and thronged the venue of his rally which was attended by past and present governors of states in the region. The event also had in attendance Nigeria’s former President Goodluck Jonathan who informed the crowd of supporters that “PDP is the only party that can make sure all of us eat very well, in the morning, in the afternoon, and in the evening”.